Bright blue and aqua always remind me of cool freshness. Although pink is one of SG's favorite colors, dramatic blue jewel pieces have a special place in my heart. A splash of blue will brighten up any look with such style and pizzazz. I espcially adore bold blue pieces during spring and summer days with white outfits. I feel instanteously cooler and at peace looking at cool blue. 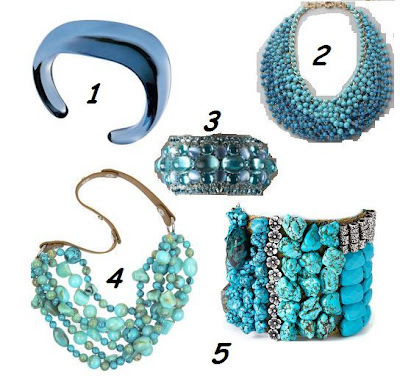 As big bold jewelry seems to become style du jour, what about a little blue drama? 1. Galet cuff $445 via Baccarat --- dramatic but might not be good for those gals who run into things easily. It's made entirely of crystal. 2. Blue bead necklace by Lee Angel via Shop Bob --- A dramatic aqua necklace is savvy with a strapless dress or top. 3. Blue beads cuff by Rodrigo Otazu $435 via Neiman Marcus --- SG's pick! 5. Juicy Couture Fabric cuff $348 via Nordstrom --- I am alittle surprised at the price but it's cute. 6. Blue topaz and diamond earrings via WendyB --- Luxury! 8. Guet Apens $765 via Baccarat --- I have tried this and it's certainly a statement piece. i want that nest ring from neiman's BAD. i am crazy for all these pieces -- excellent pics!!! I love all of them. They make me want spring/summer to get here. I especially like #3 and #5. They are all so pretty....I am so in love with #2. It is so fabulous! I am currently on the hunt for the perfect turquoise necklace! Oh, darling, these pieces are divine! hoping to win the lottery so i could buy all of them. #5 is sooo hot. i can't believe it's juicy! omg. i just realized the price. $348 is ridiculous. Hi there-fabulous picks, certainly a must have jewel colour for summer! How can you make me choose one? I like them ALL... I might even try to wear it all at once! DIVINE FASHIONABLE jewelry... LOVE LOVE LOVE it! 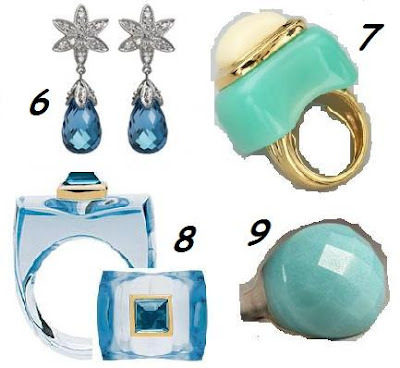 I love blue, so I adore these items! !